Set on the Northwestern corner of Canadarago Lake, this property offers 136 acres of sweeping views of the rolling countryside. Including approximately 2,150' of frontage on Rt. 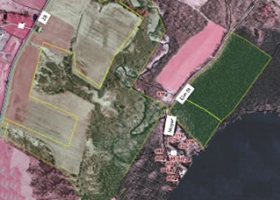 28 and 400' of lake front (restricted wetlands), this property has considerable potential for development. Additionally, over 3,200' of Trout Brook flows through this property, allowing for numerous building lots to be developed along this pristine brook. This property is comprised of five tax parcels.